This Fruit Custard Tart dessert can be done within 20 minutes. Pretty easy and simple! My lovely daughter has a sweet tooth. Whenever she wants to eat something sweet after dinner, I’d cook this dessert for her if I don’t have much time to prepare something else which is more sophisticated. Kiwi fruit and strawberry are in season in Australia right now. I can get many of them from grocery stores at a very good price. Here I used them to bake these yummy fruit custard tarts. Defrost pastry at room temperature until soft. Cut into 4 equal squares to fit into tart molds (8.5cm). Trim the pastry with a knife or a pair of scissors. Brush on whisked egg. 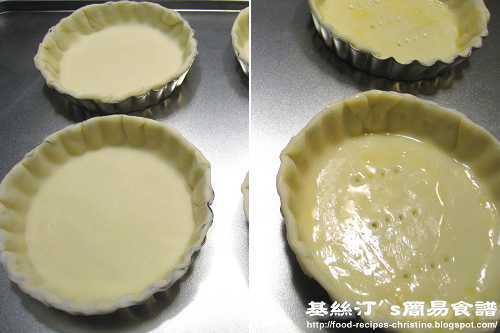 Use a fork to poke the bottom of the pastry 3 to 4 times. Bake for about 10 to 12 minutes, or until brown and crisp. 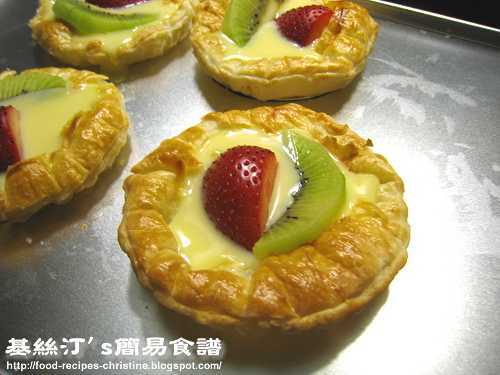 Pour custard into each tart, arrange kiwi fruit and strawberries. Put tarts back into oven and bake for another 5 minutes to warm up the custard. 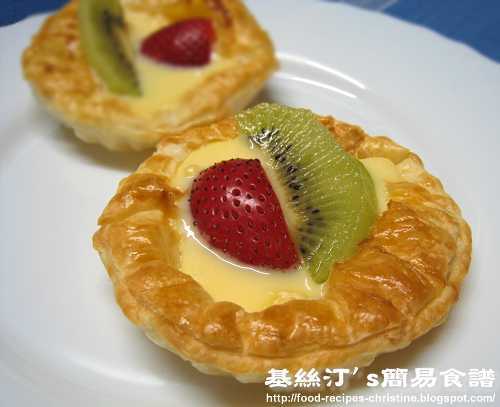 Or enjoy the tarts with cool custard and fruit. Either way would be fine and delicious. Hey Christine! Thanks for dropping by my foodblog & your beautiful compliment. Sure to add your blog to my list! Your cooking is great too. I'm glad that I found your blog. I like it very much. I've already added your blog to my blog list. Look forward to viewing more of your updates! Hi Christine, that looks really delicious! And you make it sound easy enough such that I think I can manage. I shall try it sometime and let you know! Keep cooking! Hi Christine - it was fun to find your site on foodbuzz - I too have 2 kids who like to eat, especially Chinese food (their father's Chinese), so cooking is a pleasure! I look forward to exploring your site. Love to see you here again. If I can manage, you can manage. Hehe....Certainly, I'll keep cooking for my family and experiment some more new recipes. Yeah, "you don’t have to be Chinese to cook Chinese food with a true Chinese flavor" I couldn't agree with you more! I'll plan to spend more time on exploring your blog. Was looking for a simple and quick dessert recipe and came across your food blog, NICE!!! If I bake the puff pastry first, can it be kept in the fridge to maintain the crispiness? If i follow the step 2, put it back to oven, means this dessert serve warm? I'm afraid you can't keep the crispiness of any baked puff pastry. But you can return the chilled pastry to oven and reheat it, that might help. Is it a good idea to make these 2days before I need them? They are for a birthday party bt I am working for the next two days and wanted to make them tonight. Would the pastry become soggy because of the custard? Love your blog by the way, used a lot of the recipes. Hope u can help, thanks. Guess that it's not a good idea to make these tarts 2 days ahead. The pastry will become soggy very soon once the custard is filled. I thank you for sharing your culinery experiences and taking all these beautiful photographs of your mouthwatering creations. This is a "drool-worthy" blog! May I ask if the "5 Tbsp low-fat vanilla custard" that you used in this recipe was made with custard powder or egg yolks? I took a short cut and used the ready-made vanilla custard from supermarket to make this dessert.